In this study, we investigated the bacterial communities in the shrimp and sea cucumber culture environment, including shrimp ponds (SP), sea cucumber ponds (SCP), mixed-culture ponds (MCP) and the effluent channel (EC) in Qingdao, China. Bacteria cultivation showed that the counts of heterotrophic, nitrate-reducing and sulfate-reducing bacteria in the sediment of SP were higher than that in the sediment of SCP and MCP, varying between 8.7 × 104 and 1.86 × 106, 2.1 × 104 and 1.1 × 105, and 9.3 × 101 and 1.1 × 104 CFU g−1, respectively. In contrast, the counts of ammonium-oxidizing and nitrifying bacteria in the sediment of SP was lower than that in the sediment of SCP and MCP. Denaturing gradient gel electrophoresis (DGGE) of 16S rDNA gene and dendrogram analyses showed that bacterial diversity in the mixed-culture environment was higher than that in the monocultures. The similarity of bacterial community between EC and SCP or MCP was higher than that between EC and SP. 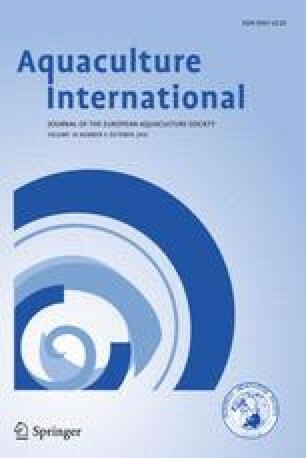 These results indicated that sea cucumber culture played a significant role in influencing the environmental bacterial communities that were composed mainly of Flavobacteriaceae (64.3%), Bacteriodetes (21%) and delta proteobacteria (14.7%), including the genera of Croceimarina, Lutibacter, Psychroserpens and so on. The results explained the benefit of sea cucumber culture in shrimp ponds at the level of microbial ecology. Financial support of this work was provided by the Fund for postdoctoral research of Shandong Province (200601011), the National high-technology development programs(2006AA10Z414, 2006AA10Z415). We thank Professors Cui Yi and Jun Zhao for their help in sample collection. We are also grateful for Xiaoxi Wang for help in sample treating.